Improving fall protection can minimize the risk of injuries and even death on the jobsite. Did you know that falls are the most common causes of work related injuries and death? 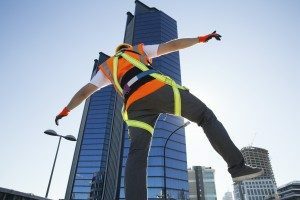 Jobsite injury can be avoided, especially falls. To avoid causing injury to your workers and stress on your other employees, read on to find out more about what the Occupational Safety and Health Administration recommends when dealing with the causes of falls. Employers are responsible for setting up their workplace in such a way to protect their employees. In construction jobs, the risk of falling from great heights, or falling due to holes in the floor or walls can be very common. OSHA, a government organization requires that fall protection be guaranteed at elevations of as little as four feet in general work places, six feet in construction and five feet in shipyards. Due to this, employers are responsible for complying with federal regulations to keep their workers safe. What Safeguard Can Be Put In Place? -Guarding every floor hole where someone could potentially fall by using a railing or floor hole cover. -Providing a guardrail around every elevated platform that has open sides. -Fall protection may also include safety harnesses, stair railings and safety nets. Employees should always be informed when it comes to certain risks at a jobsite. Employers are required to tell employees about working condition dangers and train them about job hazards and how to avoid them. Employers are also required to provide equipment to workers to protect them at no additional cost to the worker and make sure that the floors and work areas are clean and safe. This entry was posted on Friday, July 7th, 2017	at 8:09 pm	. Both comments and pings are currently closed.